It’s coming to the end of our volunteering year. Phew! Team 4 arrived back safely 2 weeks ago, but we have been super-busy trying to address some of their problems, as well as sort out some tricky logistics for Team 5; so we have yet to update our friends and supporters on what Team 4 got up to! Sorry for the delay – the team leader’s report was just posted last night – we will update you as soon as possible. Meanwhile, our last team for the year, headed by Dr David Sheen, arrives in TL tomorrow. Accompanying David, is long-time volunteer, Dr Geoff Knight, and Sydney prosthetist, Dr John Darby. Team 5 is working in the Oecusse and Maubisse areas. Oecusse is an East Timorese enclave within West Timor (Indonesia). It is Timor Leste’s East Berlin – difficult to get to, significantly poorer, and with less services than the rest of TL. With equipment and vehicles, one gets there via road or via sea. The road option takes a several hours visit to the Indonesian embassy, a whole day drive through 60km of West Timor, stopping at multiple military checkpoints, and multiple ‘extra’ payments. It was a total pain the last time we chose the road. So, this time, the team is trying to get their by boat; however, the last time a team took the sea-option, our vehicle almost went for a swim. So…Good Luck Team 5! Team 2 returned from TL on the 6thJune after a 10-day whirlwind trip. 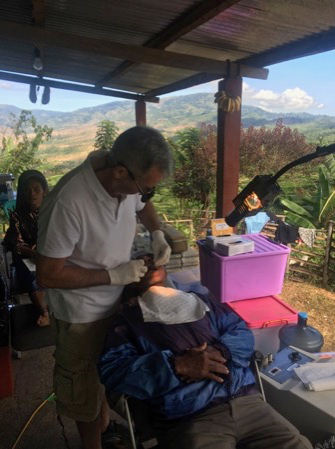 The team consisted of team leader, Dr John Moran, his steadfast mate, Dr John Whyte, newbie volunteer, Emma Whyte, the TLDP’s dental therapist, Nicolau Tolentino Pires (Nico), and Australian-trained, Timorese dental assistant, Ana Paula dos Santos Tavares Salgado. This team is well known for its efficiency. They covered a lot of ground; dividing their time between the Railaco, Kasait and Maubara areas. In Railaco, they were hosted by our Jesuit partners, and as usual were kept thoroughly fed, watered and entertained by the ebullient Father Bong, with his team, Fathers Truong, Phong, Siriak and Sagi, plus trainee Jesuit, Ismal. Lively dinner discussions, well-oiled by wine, ranging from attitudes towards eating pets, to a coffee delicacy produced from predigested coffee beans, and libido-limiting fruit, kept the team recharged during their stay in Railaco. The team had a single day before equipment issues started rolling in. Day 2 saw the foot pedal of one of our dental units go bust, necessitating a 4 am dash back to Maubara for Nico on Day 3 to get the spare. Luckily for this team, Railaco is one of the closest locations to Maubara. Nico was back 3 ½ hours later, the offending foot pedal fixed, and the team headed off to Railaco Leten, almost 2 hours drive away. Day 5 was a day of endurance and patience for the team – they had to set up and break down the portable clinic twice. Their clinic in Nasuta was stymmied not only by yet another new public holiday – Children’s Day – but also the Sacred Heart of Jesus Procession. After only a few patients, the team packed up and headed back down the hill and spent the rest of the day in Railaco Parish Clinic Centre. The final 2 days were spent in Maubara, first at the senior high school, then finishing up at our base clinic. The team experienced their final breakdown – one of the dental carts turned up its toes – but reached the finish line with their good humour unscathed! They spent some time at the Maubara Orphanage, where they were treated to a coffee, biscuits and a little concert. A fabulous way to end a visit! Overall the team did 849 treatments, including 266 fillings, 229 extractions, and 132 preventive treatments. The two Johns are also great teachers and they spent a large amount of time with Nico, honing his restorative skills. Despite the setbacks, the entire team had a fantastic time and enjoyed working and living together immensely. Go Team 2! Our next team is ready to hit the road this Friday. The dynamic duo, Dr Andy Moran and Dr Gordon Saggers, is our Railaco-specific team this year. They will spend their entire 2 weeks in the company of the fabulous Father Bong and his merry crew. They will be taking over a new pressure cooker autoclave that we have just purchased from India. This autoclave will live in Railaco, which will mean that Tino (the super-dedicated Timorese dental therapist we mentor), who lives in nearby Gleno, can run a regular outreach clinic there. Good luck and have fun Team 4! The TLDP sends another team to TL’s fair shores this week. Close buddies, Wayne Pearson and Blanche Tsetong, first met in TL many years ago while serving in a dental team headed by program founder, Sandra Meihubers. With one exception, the pair have formed the core of a team every year since. This year, the pair was to be joined by newbies Beth Bowen and Mary Tuituinnik, however, both gals have had family issues and have had to bow out, leaving the redoubtable Sally Stephens to fill the breach. Sally continues to amaze us all with her dedication and enthusiasm and I am sure this team will have a ball in her company. As this team is tiny, it gets to got to Letefoho! Scenic, airy and peaceful, with Ramelau within spitting distance, Letefoho is one of the most stunning places the teams have had the privilege to visit. The region also has some of the worst roads and, as a result, is very isolated. Lots of work. Lucky Team 3! Wayne leaves his cattle in Grafton, and Blanche, her renovations in the Sunshine Coast, to fly to Darwin this Friday and onward to TL Saturday morning. This Sunday our first team for 2015 heads to Timor Leste’s sunny shores. 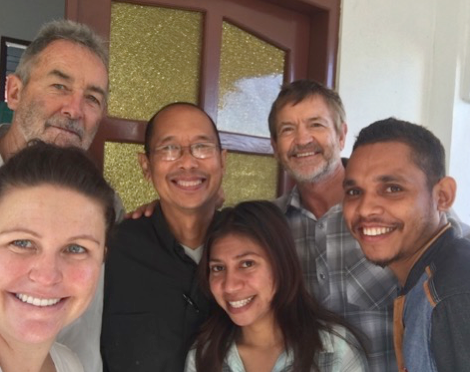 The team, led by Dr David Sheen, has the important tasks of touching base with our network in TL, as well as the installation of the dental chair in Railaco, on top of the usual tasks of treating the East Timorese and mentoring Timorese Dental Therapists that are our everyday challenges. David is joined by new volunteer, Patrick Fitzgerald, and by Keith Mentiplay and Dr Peter Shakes. We are also very lucky to have Sally Stephens join the team for the first time. She is an Aussie dental nurse who currently resides in Dili. 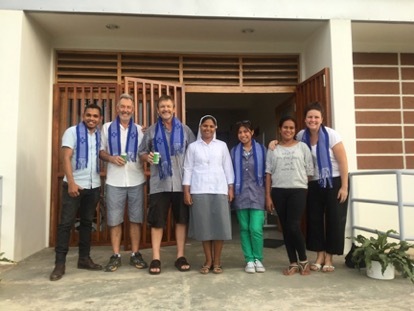 We wish them a safe and productive trip and hope that their interactions with everyday East Timorese continues to build peace, understanding and resilience within this still very young nation. As promised, Father Bong and his merry band picked up the equipment for the Timor Leste Dental Program on Sunday and hauled it to Railaco. The heavy weight and unwieldiness of the items proved no obstacle to team’s determination and cooperative efforts to move them into the clinic. Thank you to Father Bong and his team and to Daryl Mills and his team, without whom these dental materials and equipment would still be sitting on the dock in Dili. Our amazing friend Daryl Mills, the hardworking Rotary Liaison in Timor Leste, has informed us that the container carrying our precious equipment and materials has arrived unscathed! Our partners in Railaco, Father Bong and his team, will be taking it all to Railaco for our first team to sort when they arrive. Just in the nick of time! Team 1 hits Timor Leste’s sunny shores on the 20th April, in just over a week. 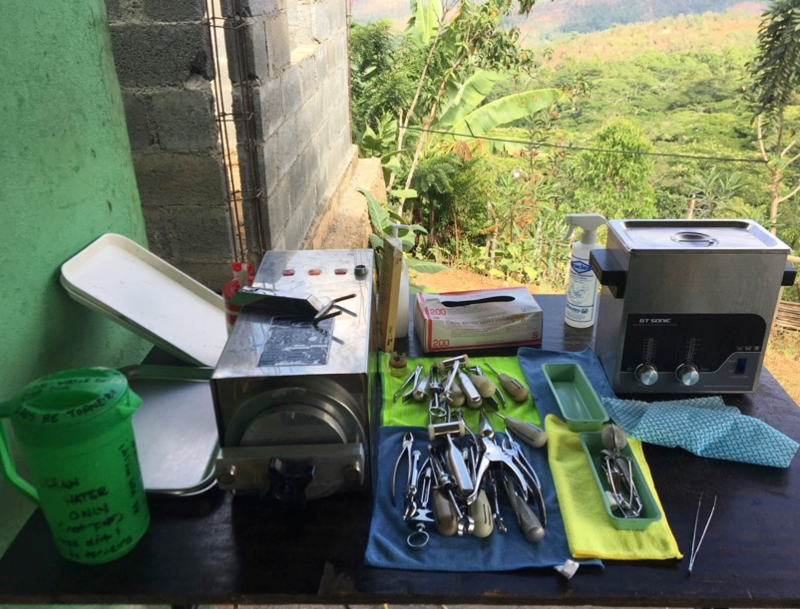 As we are creating a new fixed dental clinic in Railaco, to be used by the team when in the area, the refurbished dental chair, drill unit and suction unit will be installed there permanently – Team 1’s Keith Mentiplay’s first job! 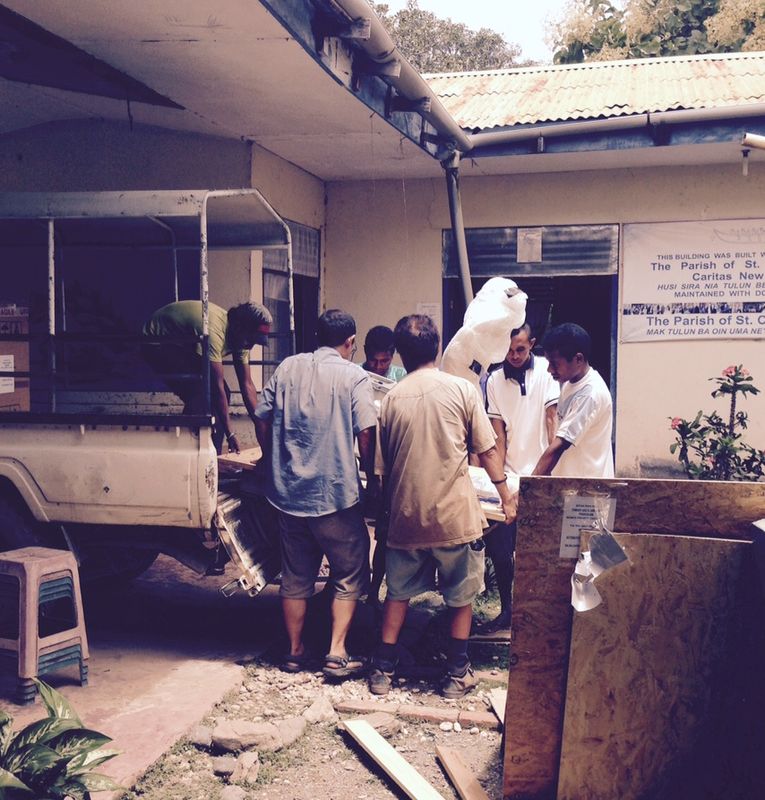 The remainder of the materials and equipment will be taken by the team back to Maubara. Equipment in TL must be hardy – it must be able to cope with the humidity, the heat, the dusty conditions and uncertain electrical currents. 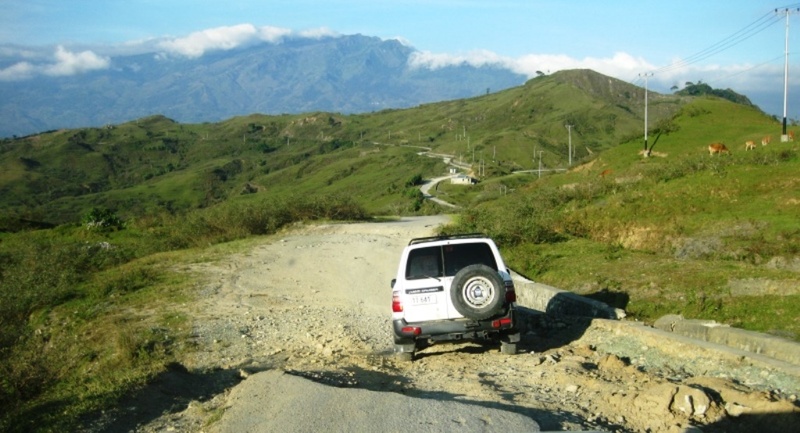 But its first challenge is to withstand Timor’s roads.